Whitney Port’s engagement ring from Tim Rosenman is a classic beauty just like the star herself. With an oval-cut diamond set in rose gold, it has a unique look that’s decidedly old-fashioned. Crafted by celebrity jeweler Ron Bensimon, it is one of a kind and well worth a peek. Like Whitney Port’s engagement ring, this stunning example from Brilliance features a gorgeous oval-shaped diamond. Dozens of accent diamonds dance on the band, and a splendid halo provides the appearance of a much larger center stone, giving the wearer a more glamorous look without the high cost of a massive celebrity-scale diamond. Born in Los Angeles on March 4th 1985, Whitney Port is an American fashion designer, television personality, and author. She was raised in LA, where she attended Warner Avenue Elementary School and served as her class’s president during fifth grade. Whitney attended Santa Monica’s Crossroads School as a teen and graduated from UCLA after majoring in gender studies. After graduating from college, Port held internships with magazines W and Women’s Wear Daily. She held an internship with Teen Vogue afterward, during production of the first season of The Hills. During the show’s third season, Whitney was promoted, gaining a prominent position as the West Coast fashion contributor for Teen Vogue. After leaving the magazine in 2008, she began working with Kelly Cutrone’s public relations firm, People’s Revolution. Whitney’s book, ‘True Whit: Designing a Life of Style, Beauty, and Fun’ was published in 2011. Port stole the spotlight and forayed into acting when in 2006 she was cast in the reality TV series The Hills, which chronicled both the personal and professional lives of Whitney and friends Heidi Montag, Lauren Conrad, and Audrina Partridge. She has appeared in Entourage, Family Guy, Genuine Ken, and Anna & Kristina’s Beauty Call as well. Did you know that Whitney Port was employed by fashion icon Diane von Furstenberg? She moved to New York in 2008 and launched her own fashion line “Whitney Eve” shortly after, in 2009 while The City was still underway. In 2012, she had the honor of serving as a judge during the eighth cycle of Britain & Ireland’s Next Top Model. Whitney and Tim met in 2008 on the set of Whitney’s MTV reality series The City. Tim, who was the show’s associate producer, felt an instant attraction to the gorgeous Whitney. The couple began dating in 2012 and he proposed in Australia in 2013. 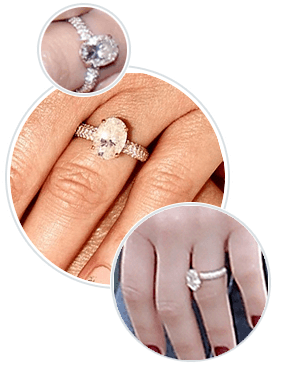 What Our Experts Have to Say about Whitney Port’s Engagement Ring. Whitney Port’s engagement ring contains a beautiful center diamond from Israel. Although the exact size of the oval-shaped stone has been kept a secret, it appears to be in the three carat range. Dazzling accent diamonds add a chic, glamorous touch and provide additional sparkle to the overall presentation. Fiancée Tim Rosenman has kept mum about the ring’s price. While celebrity engagement rings with massive center stones carry high price tags, a ring that takes inspiration from Whitney Port’s can be surprisingly affordable when you work with Brilliance. Using our fun, interactive online design tools, you can collaborate with our diamond experts to create an exact replica of Whitney’s engagement ring or design a completely custom look that’s yours alone. Suit your style as well as your budget by working with Brilliance. We bring sparkle into your life with diamond engagement rings that celebrate your love in style.